Every year, at GKV, August 8th is commomerated as the Founder’s Day, usually with a snack or meal for the children. This year, when Mrs. Gita Krishnamurthy would have been 74 years old, was special as the formal inauguration function of the school building was held on that date. 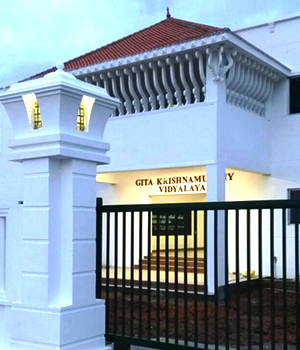 GKV started functioning in a rental building in June 2009. 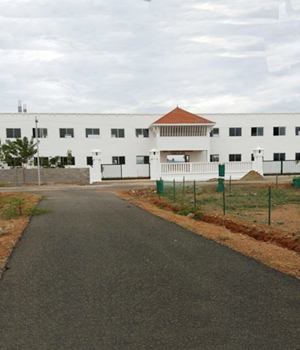 The land for the school building was acquired in 2012 and the Bhoomi Puja for the school was done by Sri Jayendra Saraswathi Swamigal in July 2013. 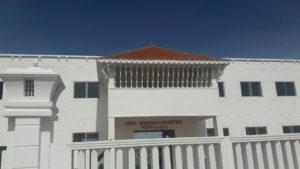 After all the necessary permissions, the construction of the school building was started in October 2013. 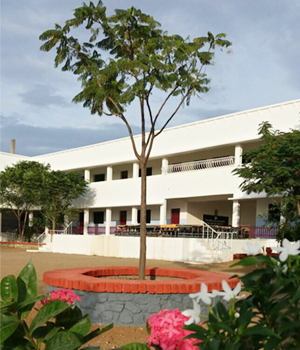 With the ground floor classrooms almost completed the school started functioning in the building from the academic term of June 2015. 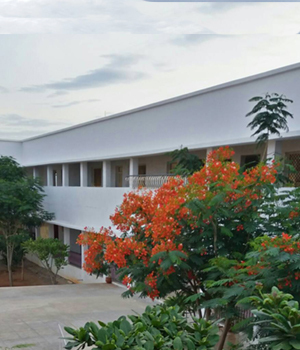 Now with the partial completion of the 1st floor including the facade, the school building has 22 rooms, which will meet the needs for the next few years, including rooms for a computer lab, science labs and library. The inauguration was formally done by Mr. Sandeep Nanduri, the Collector of Tirunelveli district on 8th evening. Other guests of honour for the function were Dr. A. John De Britto – Registrar Manonmaniam Sundaranar University and Rev. Paul Hunt, Senior Chaplain, of our partner school, Emanuel School of London. 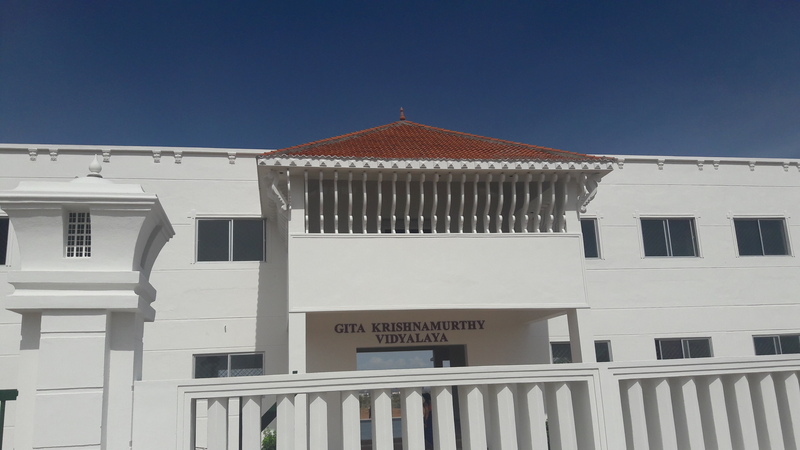 All except three trustees, who had other commitments, of Gita Krishnamurthy Trust and family members of Krishnamurthy – the Managing Trustee of GKT were witness to the momentous milestone. 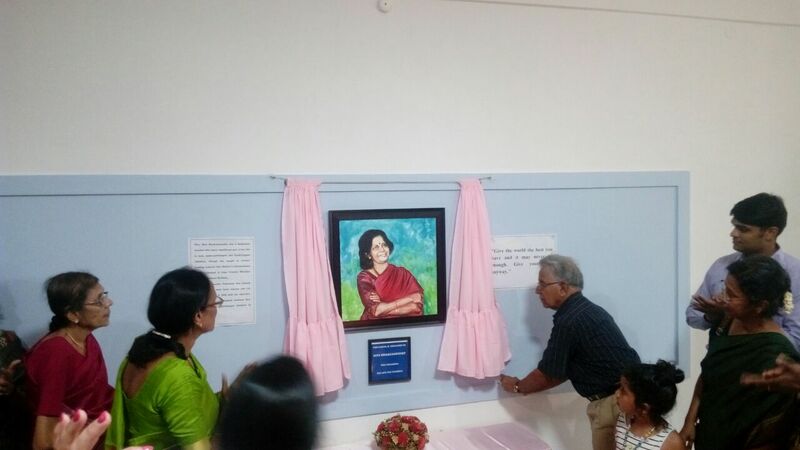 The whole function was planned and executed by Mrs. Usha Raman and Mrs. Nirmala Ramrathinam, Principal and Correspondent, respectively, of Sri Jayendra Golden Jubilee School, with the enthusiastic assistance of Teachers and Staff of Jayendra and GKV. 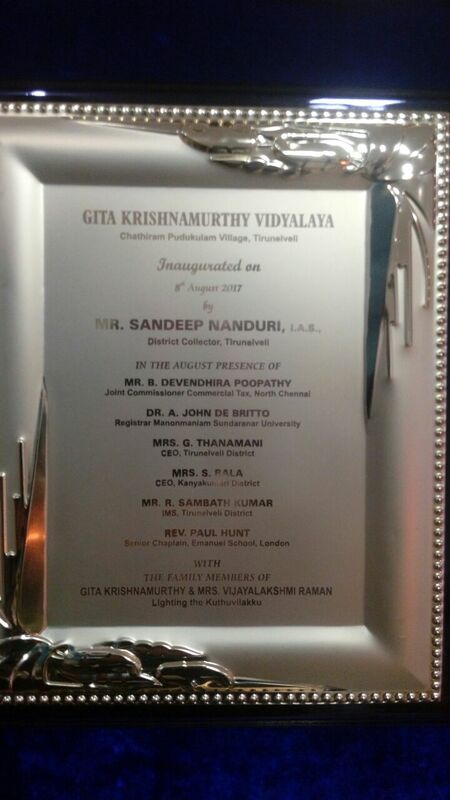 The formal inauguration with ribbon cutting was followed by the traditional lighting of the ceremonial lamp by Krishnamurthy and his family members and the unveiling of a portrait of Gita Krishnamurthy. Just as the formal portion of the inauguration kicked-off on the stage located in the grounds of the building, it started raining heavily forcing the trustees and guests of honour on the stage as well as the hundreds of parents, children and teachers of the school to take shelter in the School Building. After a brief hiatus, the function resumed in the lobby at the entrance of the building. Mr. Nanduri unveiled the plaque and both he and Dr. Britto talked about the importance of education and the hugely positive impact GKV is making to the under privileged in the area. Mrs. Usha Raman felicitated the guests of honour, the Trustees of Gita Kirshnamurthy Trust as well as the many vendors and partners who contributed to the school over the years as well as the Building Contractor, the Artist who painted Gita Krishnamurthy’s portrait and Dr Ramakrishnan from Aravind’s Eye Hospitals, a large socially active Organisation, who also carry out periodic eye check-ups for the children. Venkat, Gita Krishnamurthy’s son and a Trustee of GKT, talked about how Mrs. Krishnamurthy used to teach underprivileged and physically differently abled children in the after school hours, while working as a teacher in the different cities she lived. It would have given her immense pleasure to see GKV and the manner in which it is being conducted. 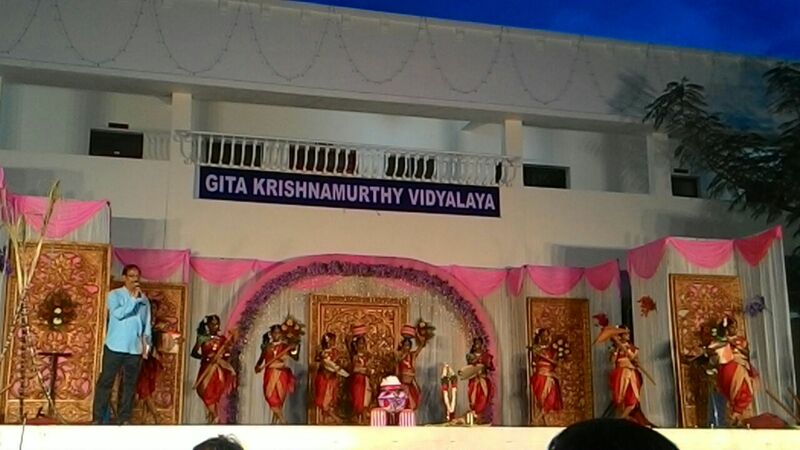 Once the rains stopped, the cultural program by the children of GKV was held on the stage to enable the parents and all other guests to enjoy the same. It is worth mentioning that all the Invitees as well as the Parents of the children waited till the rains stopped. And what an amazing 45 minutes of dance, music, mime and skits it was!! The energy level, enthusiasm, confidence and talent of the children , performing for the first time ever on such a large stage with sizeable audience, was incredible and everyone enjoyed it thoroughly. It provided a fitting finale to a very satisfying evening to all those present as well as to the children who put in many hours of practice. A grand dinner was hosted to all those present after the programme by the children was over. 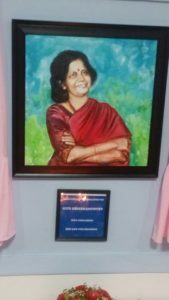 The GK Trust would like to thank the trustees of partner Sri Jai Sankara Educational Trust as well the teachers and staff of Sri Jayendra Golden Jubilee school and GKV, without whose commitment and tireless efforts all these years, this milestone could not have been achieved. Needless so say, the contributions and support of numerous family members and friends as well as Organisations such as Grand Circle Foundation, USA, Infosys, Juniper Networks and Microsoft have helped us to get to this stage in our progress to set up GKV. We do look forward to the continued support from all our well wishers to enable the school to provide holistic, quality education and enable the children to achieve their and their family’s aspirations!! This entry was posted in events on September 10, 2017 by Bhasker Sharma.